They add so much to any dish — be it soups, salads, sauces, gratins… To indulge in ripe, juicy tomatoes, is a different experience altogether. When buying tomatoes, look for ones that have a distinct tomato aroma. Depending on the variety, they can be tautly firm or give slightly – either way, make sure that they are not bruised or with soft spots. Don’t worry about seams or discoloration. If a tomato has already started the ripening process – if the green background is giving way to a yellow – it can continue to ripen at home. 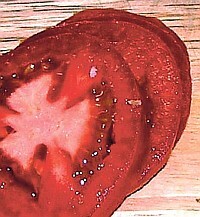 Do not refrigerate tomatoes since the cold air destroys their taste. Unless they are cherry and/or grape tomatoes, don’t stack them on top of one another. Store on the counter or in a shallow basket, stem end down. To make raw tomato dishes less watery all you have to is to chop the tomatoes, transfer them into a footed colander, sprinkle with coarse salt and toss. Allow them to drain up to an hour, and use as desired. Season chopped tomatoes with fresh-ground black pepper, fresh garlic or herbs. Spoon over grilled fish or meat, or place them in a bowl with fresh ricotta or mozzarella cubes and toss with hot pasta. Method : Clean and slice tomatoes and place in a serving bowl. In a food processor, mince the fresh cilantro and add the olive oil in a steady stream until blended. Add Balsamic vinager to the cilantro-oil mixture and blend. Season and pour over tomato slices and serve. • Use as a filling in omelets, frittatas, and crepes with finely chopped roasted tomatoes and bold cheeses and herbs.